Track energy flow through an ecosystem. Construct a concept map to differentiate between aerobic and anaerobic respiration. Conduct experiments to investigate photosynthesis and cellular respiration. Investigate the process of fermentation. Construct models of the carbon, oxygen, nitrogen, phosphorous, and water cycles. Interpret a diagram that illustrates energy flow in an ecosystem. Food Chain - National Geographic for Kids has a featured Quick Flick from Brain Pop on the subject. Welcome to Biology 2002 - This college level PowerPoint show has some great images. Save the show, throw out the college content and modify the show for your classroom. Compare and contrast photosynthesis and cellular respiration in terms of energy transformation. Photosynthesis: How do plants make food? 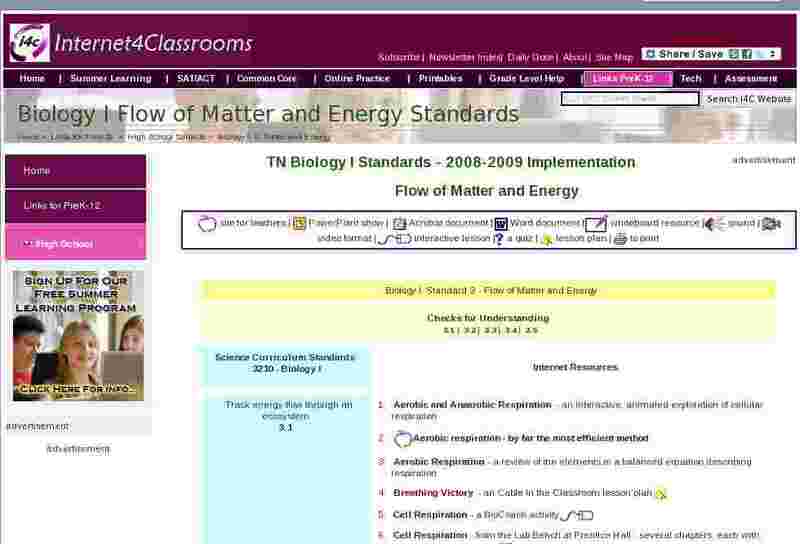 - a Teacher's Guide to show number 907 in the Newton's Apple series. Photosynthesis: Don't "Leaf" Out Fall's Most Valuable Lesson! - (a lesson planning article from Education World) They have raked up a pile of activities for you to "leaf" through. Why Do Leaves Change Color in the Fall? - To answer that question, you first have to understand what leaves are and what they do. Predict how changes in a biogeochemical cycle can affect an ecosystem.